Prime Minister Benjamin Netanyahu referenced Hebron in his speech to the United Nations General Assembly. "President [Mahmoud] Abbas just attacked from this podium the Balfour Declaration. He's preparing a lawsuit against Britain for that declaration from 1917. That's almost 100 years ago – talk about being stuck in the past. The Palestinians may just as well sue Iran for the Cyrus Declaration, which enabled the Jews to rebuild our Temple in Jerusalem 2,500 years ago. Come to think of it, why not a Palestinian class action suit against Abraham for buying that plot of land in Hebron where the fathers and mothers of the Jewish people were buried 4,000 years ago? You're not laughing. It's as absurd as that. To sue the British government for the Balfour Declaration? Is he kidding?" PM Netanyahu was referencing the Palestinian Authority leader's address to the UN just hours before in which he called for an apology from the British government for the historical document. “With the coming of this painful anniversary, the passing of approximately 100 years since the historic massacre of our land and our people’s fates, and with the continuation of this catastrophe without a resolution, we call on the secretariat general of the Arab League to support us in preparing a legal file to raise against the British government for issuing the Balfour Declaration and thereafter implementing it as a mandatory authority." In his recent tenure as Prime Minister, Netanyahu has expressed support for the Jewish Community of Hebron. 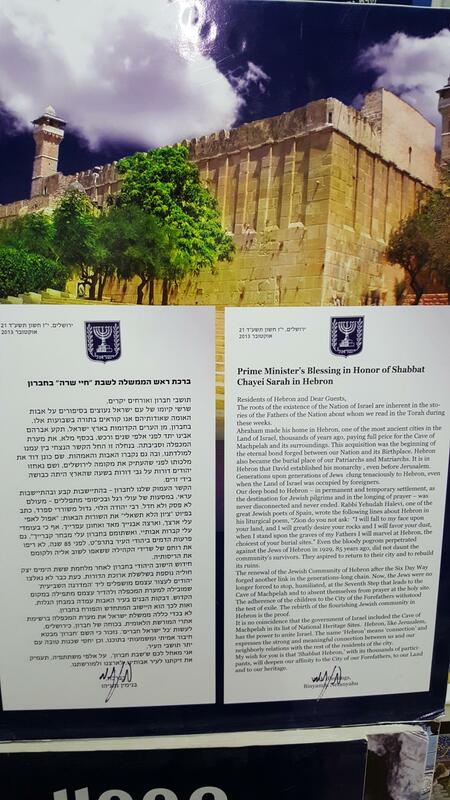 In 2013, just before the annual Parshat Chayei Sarah Shabbat celebration, the Prime Minister sent a letter of support to the community. The roots of the existence of the Nation of Israel are inherent in the stories of the Fathers of the Nation about whom we read in the Torah during these weeks. Abraham made his home in Hebron, one of the most ancient cities in the Land of Israel, thousands of years ago, paying full price for the Cave of Machpela and its surrounding. This acquisition was the beginning of the eternal bond forged between out nation and its Birthplace. Hebron also became the burial place of our Patriarchs and Matriarchs. It is in Hebron that David established his monarchy, even before Jerualem. Generations upon generations of Jews clung tenaciously to Hebron, even when the Land of Israel was occupied by foreigners. Our deep bond to Hebron -- in permanent and temporary settlement, as the destination for Jewish pilgrims and in the longing of prayer -- was never disconnected and never ended. Rabbi Yehudah Halevi, one of the great Jewish poets of Spain, wrote the following lines about Hebron in his liturgical poem, "Zion do you not ask: "I will fall to my face upon your land, and I will greatly desire your rocks and I will marvel at Hebron, the choicest of your burial sites." Even the bloody pogrom perpetrated against the Jews of Hebron in 1929, 85 years ago, did not daunt the community's survivors. They aspired to return to their city and to rebuild its ruins. The renewal of the Jewish Community of Hebron after the Six Day War forged another link in the generations-long chain. Now the Jews were no longer forced to stop, humiliated, at the Seventh Step that leads to the Cave of Machpela and to abstain themselves from prayer at the holy site. The adherence of the children to the City of the Forefathers withstood the test of exile. The rebirth of the flourishing Jewish community in Hebron is the proof. It is no coincidence that the government of Israel included the Cave of Machpela in it list of National Heritage Sites. Hebron, like Jerusalem, has the power to unite Israel. The name "Hebron" mean 'connection' and expresses the strong and meaningful connection between us and our neighborly relations with the rest of the residents of the city. My wish for you is that "Shabbat Hebron,' with its thousands of participants, will deepen our affinity to the City of the Forefathers, to our Land and to our heritage.